Carob Chip Brownie Cookies aren't seen in their best light! This isn't the first time i've sliced my finger while cutting produce! as a good warning to always be careful! Okay, no more finger pictures, for all of our sakes! See, what I was trying to do was successfully cut up vegetables... not my hand! Question: Are you accident-prone in the kitchen like me? Owwie! I am accident prone. 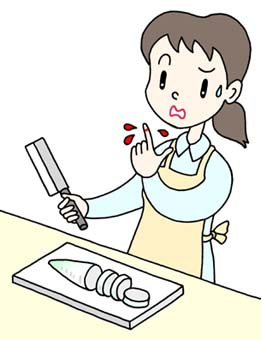 I refuse to sharpen knives and make the man do that because I just know I will lop a finger off! I just got the blade of the blender under my fingernail yesterday. Ouch. I can't tell you how many times I have cut myself in the kitchen. I am no hand model now, that's for sure. Sorry about the finger, but your eats look good! ouchy!! Hope it heals soon! I cut and burn myself a lot in the kitchen. It is not a pretty sight! That's why I bought the precut broccoli and cauliflower at Whole Foods the other day. Well, that, and because I'm lazy. I don't have that much time to devote to veggie cutting these days anyway...which is probably a good thing, considering my history of almost chopping off my hand haha. Ouch! Sorry about your finger. :/ Small cuts like that close to the nail seriously HURT too!! I almost nipped the top of my finger off while slicing squash not too long ago...but other than that it's mainly burns that get me in the kitchen. Oh no! So sorry you hurt yourself. I'm accident prone in the kitchen too! Mostly b/c I have no idea what I'm doing most of the time! All your eats look so great though! I am sooo accident prone in the kitchen! Thankfully, I have never been hurt badly and I learned how important it is to have a sharp kitchen knife. Awww, sorry about your finger! I've definitely had my share of kitchen accidents. I sliced my finger open with a mandolin once, and I also cut myself on a cheese grater once. My skin came off in a circle, just like cheese... it was so gross. I guessed you were cutting squash before I saw that you actually were- the tip of your finger is orange :) Unless your hands are as orange from mine from EATING squash! Ouuuch! Hope it hurts less than it look likes it does! I'm such a baby when it comes to cuts like that. I'm not too prone to kitchen accidents, but I do other silly things like skipping baking soda in a muffin recipe or forgetting some other key ingredient. OUCH oh man that must've been painful! And bloody! But the end result looks amazing. Since I don't have a fancy sandwich press and rarely like to dirty a pan for frying, I always bake my wraps before eating them :) And plus, I use the same brand of rice wraps as you do (I've been eating at LEAST 4 a week since school has started! They're so yummy and super portable!) I agree though, they taste super yummy when baked! Oh ouch, it seems like a lot of people have been slicing themselves lately. I hope your okay. I've never experienced a kitchen incident like that, but one time my sister had to get stitches from slicing herself with a can of soup. I cut my hand really badly a couple months ago - it was brutal. Ouch! Sorry you hurt your finger. I've definitely had my fair share of kitchen accidents before, usually while cutting vegetables or fruit. Oh my . . . it may not be serious but it looks horrible! And it's no doubt uncomfortable!!! i left for school yesterday at 5:40pm and it was still light out. the longer days are a coming!!!! i hope you got a big ol band aid on the that finger. try a drop of lavendar oil it to help the healing process. Aww your poor finger! :( I super klutzy in the kitchen too. I somehow ALWAYS have a fresh cut somewhere on my hands from cutting produce. I think I need to start wearing heavy duty gloves in the kitchen haha. My apartment has the worst natural light - it is so frustrating! I am a total klutz in life, but especially in the kitchen. I am constantly cutting my fingers when I chop onions - I've got to find a better way! I never used to be accident prone, until I started working in the kitchen! Your finger, it looks like you cut it pretty bad! I bet it hurts! In the last 2 weeks alone, I've dropped and shattered 3 pretty glasses and our glass bottle of maple syrup (still full!). I was crying because I just felt so awful about breaking so much stuff. Uh, I stuck my hand into a moving blender. Does that count as accident prone or just stupid? Wait, don't answer that. I didn't post pictures of the resulting injury - I was too busy literally spraying blood over the cabinets. It was awful. It looked like a scene from CSI. The knife does not turn against me too much. But I usually get burns which is why I have a standby burn ointment near the stove. Anytime I burn myself, I just pick it up and apply. No panicking.